Beautiful 5 bedroom 5 bathroom amazing ocean view home 1/4th Equity Share! 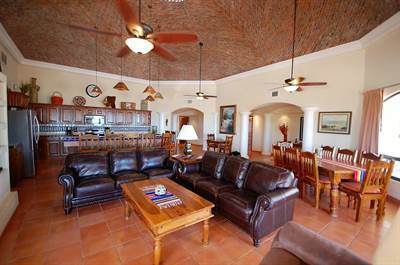 Immaculate, well maintained home with beautiful views in sandy Section 2 of Las Conchas. Fully equipped kitchen cooks will enjoy. Dishwasher, microwave, outdoor BBQ. Quality linens provided. Laundry room with full size washer and dryer. Stereo, DVD players, satellite TV, telephone, wireless internet, and game room with bar sized refrigerator. Steps to the beach with access directly across from the house. Ample off street parking and four garage spaces. Gated community with 24 hour security. Two recently replaced A/C units, Two new 50 galloon water heaters – this home is nothing short of amazing. One of the wonderful parts of owning an equity share is you just need to show up.